“I’m the stuntman of romance and I’ve been falling in love since I was three,” so said Rupert Holmes, the man who began his career in the sixties by arranging songs for the Platters and The Drifters. He wrote many songs anonymously in the bubblegum era which is where he learnt his craft. He knew that he could write great songs, but for some reason they didn’t interest the public, but he never gave up. Rupert was born David Goldstein in Northwich in Cheshire in 1947, his father was a United States Army warrant officer as well as a bandleader and they moved back to the States when Rupert was six. In the mid seventies he was writing songs for artists like Barry Manilow, Dolly Parton and Judy Collins and in 1974 his debut solo album, Widescreen, was released in the US and included witty songs done in an amusing musical way. Barbra Streisand discovered the album and asked if she could use a couple of the songs for her latest movie, A Star Is Born. This inspired him to keep writing and recording. His most well known song was Escape, (The Pina Colada Song) which he’d written the music for about three years earlier just for his own amusement and called it People Need Other People, but then left it. One day he decided it was time to dust if off and add the lyrics. He’d already planned his fifth album which was called Partners in Crime and it was predominantly full of ballads so decided he needed an up tempo song. Then came the recording, Rupert explained, “The drummer, Leo Adamian, suggested we have two drummers on the session because it was an interesting beat that was hard to pull off with one drummer, so we got the second drummer and we did one take of the tune. It had some very interesting chord changes and changed key several times, and I’m singing away this lyric, ‘people need other people.’ and then we go in to hear back the first take and we listen to the cut, and I say ‘you know, we can definitely do better than this,’ and I look and I see that the second drummer was unconscious from having too much fun. We were able to wake him up and get him into a taxi, and that was that, we weren’t going to record any more of that track. I figured I’d just put the song away – I wasn’t that crazy about the lyric anyway. Rupert thought the song Him, which was actually the follow-up, should be the first single from the album, but the record label liked this and convinced Rupert that they should release it first. They got it played on a radio station in Washington, and people started calling in to the station asking for it. The problem was that they were asking for The Pina Colada Song and the official title was Escape. This hurt sales because people would ask for ‘That song about Pina Coladas’ at record stores and the stores had no idea what they were talking about. 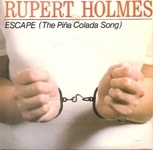 The record label wanted to change the title to “Escape (The Pina Colada Song)” and told Rupert it wouldn’t sell if they didn’t, so he agreed. Whereas Rupert made up the whole thing after being inspired by an ad, for someone else it was actually a real scenario. There was a couple in Minnesota who began trolling chatrooms independently, met and fell in love online, and when they finally met in real life, they realised they were married to each other. Unlike Rupert’s tale this couple’s experience ended in an acrimonious divorce. a twin song for Babooshka by Kate Bush … possibly?